US Social Security Administration, "Social Security Death Index", database, American Ancestors, "Gerald L Sackett, b. Feb 25, 1939, d. Nov 27, 1993, SSN 082-32-0999 issued NY, residence Endicott, New York, 13760, county Broome." "U.S. Social Security Applications and Claims Index, 1936–2007", database, Ancestry.com, "Sackett, Gerald Lawrence, b. Binghamton, New York, 25 Feb 1939, d. 27 Nov 1993, father William J Sackett, mother Louise M Demond. Listed Dec 1956 as Gerald Lawrence Sackett. 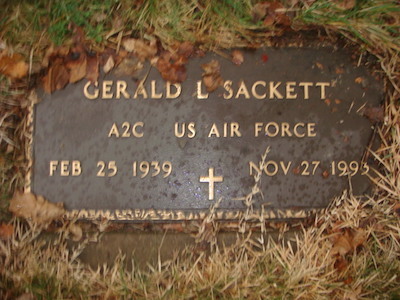 Listed 29 Dec 1993 as Gerald L Sackett." "US Department of Veterans Affairs BIRLS Death File", database, Ancestry.com, "Sackett, Gerald, b. 25 Feb 1939, d. 27 Nov 1993, branch AF, enlisted 7 Mar 1956, released 6 Mar 1960."